Join us for our regular Third Thursday Demo THIS THURSDAY when Cindy Dahl and Beth Cardozo will team up to show what can be done with the new Creative Grids Hexagon Trim Tool ruler. Create perfect pieced hexagons with 2in, 4in or 6in finished centers by squaring up each round of strips as you go. Since each round is squared up before the next set is added, the blocks created are perfect hexagons. Or use the markings to cut 2 in to 8 in finished hexagons & every size in between. 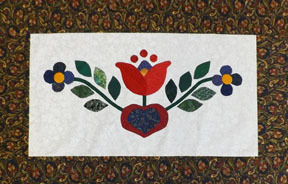 This beautiful quilt is made using the Sidekick ruler. Each star calls for four different fabrics in the same color way. Cyndi Foote will teach participants how to use the ruler from 10 – 12 and then be available for assistance while you work on your project for the rest of the day. No homework required. Join us for another Mystery Quilt program! Our second Mystery Quilt program launched on February 15th when the first clue was handed out. You can begin and pick up your first clue anytime. The five remaining clues will be available on or after the 15th of each month, through July.We’ll have a “reveal” party for all participants in October. mystery quilt top from Cortez Quilt Company.